“Texturing Space” is a collaborative research project focusing on the development of a mobile lab to investigate urban textures. 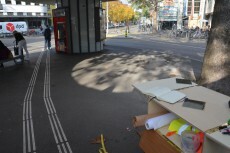 By establishing a Mobile Lab, the research team from the MA Transdisciplinary programme, Zurich University of the Arts (ZHdK) attempts to investigate texture as the fabric through which experience, action and encounter in urban environments occur between the usually separated domains of architectural structures, social relations and discursive as well as political formations. In other words, texture, might be the connective tissue between these domains defining the dynamic ground from which socio-cultural and material relations emerge. The research team aims for the Lab to not be a fixed entity but to create situations, take different shapes and forms, adapt to the needs and to adjust to surrounding environments. Ultimately, the Lab should become a shifting device that accumulates and layers experiences from different (socio-cultural and material) contexts. “Texturing Space” is a two-part seminar held in the course of the MA Transdisciplinary programme in Fall 2015 and Spring 2016. During the seminars, the initiators and participating students collaborate on developing the Lab, inventing tools and techniques for encountering urban textures, and finding suitable modes of feedback and archiving. Another crucial element is the theoretical and material (artistic and design) reflection on mobile labs, research on the notion of texture, and outlining the role of relation in experience. 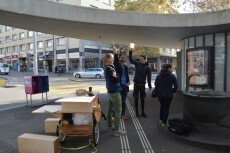 Thus far the Lab has been used in urban contexts of Zurich and will be further shaped in collaborations with students from interaction design at ZHdK. The aim is to collect a suitable amount of points of attraction, modes of encounter, and ways of archiving in order to further explore them depending on new contexts.